Reports this morning suggested that a cross-party group of TDs is planning to invoke a Constitutional provision to force a referendum on the proposed abortion laws. JUNIOR MINISTER BRIAN Hayes has dismissed the possibility of a referendum being held on the proposed Protection of Life during Pregnancy Bill 2013. 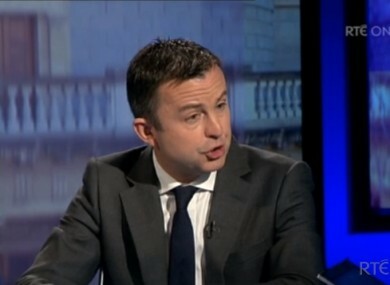 Speaking on RTÉ’s The Week in Politics, Hayes said he did not believe Article 27 of the Constitution will be used to force a vote on the issue. He acknowledged that some people in the Fine Gael party continue to have issues in relation to the proposed legislation, but added that “very extensive dialogue” is ongoing. The questions came following a report in today’s Sunday Independent which suggested that a cross-party group of TDs were preparing to invoke the little-known provision to force a referendum. If successful in their petitioning of the President, Michael Higgins would call for a countrywide vote before signing the Bill into law. Sinn Féin’s Pearse Doherty said his party would not be supporting such a move as it had a clear policy and mandate to support legislation for the X Case. “Why would we support an attempt to frustrate that?” he asked. Hayes also dismissed an argument from former Director of Public Prosecutions Eamon Barnes that the Attorney General should be allowed represent the foetus in cases where the mother is seeking a termination on the grounds of suicide ideation, calling the idea “fanciful”. He added that the government are fully confident that he legislation is constitutional and the rights of both the mother and the unborn have been vindicated. The number of “defections” within the Fine Gael party over the Bill when it goes to vote will be “quite small”, he concluded. Email “Junior Minister dismisses notion of abortion referendum”. Feedback on “Junior Minister dismisses notion of abortion referendum”.